CNC Machining - Innovative Cutting & Engraving Inc. 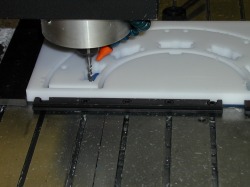 Using our cnc's we are able to offer you accurate parts at an affordable price. We can nest multiple parts in one run to maximize material usage. With bed sizes up to 5'x10' we are able to process a wide range of part sizes. ​You can utilize our secondary processes like bending, tapping to create more complex parts that are ready for use when you receive them. ​Give us a call today and see how we can help you.